Background and Objective: Femoral fractures are extremely painful and pain invariably worsens on any movement. Anesthesia for fracture femur surgery is usually provided by spinal block. This study was undertaken to compare the analgesic effects of femoral nerve block (FNB) using nerve stimulator with 0.2% ropivacaine (15 ml) and intravenous (I.V.) fentanyl before patient positioning for fracture femur surgery under spinal anesthesia. Materials and Methods: A prospective, randomized, double-blind, comparative study was conducted on 60 American Society of Anesthesiologists I and II patients (18–60 years) scheduled for femur surgery under combined spinal epidural anesthesia. Patients in Group I (n = 30), were administered FNB using nerve stimulator with 0.2% ropivacaine (15 ml) and in Group II patients (n = 30), I.V. fentanyl 0.5 μg/kg was given as preemptive analgesia. Parameters observed included time to spinal anesthesia, intra-operative and postoperative visual analog scale (VAS) for any pain and postoperative epidural top-ups dosages. Results: Demographic profile was comparable in both the groups. VAS at 2 min in Group I was 5.63 and in Group II it was 8.00. Satisfaction score was better in Group I as compared to Group II patients. Time to administer subarachnoid block was 17.80 min in patients of Group I as compared to 25.03 min in Group II patients. Postoperatively, VAS scores were lower in Group I than Group II patients. The frequency of epidural top-ups was higher in Group II than in Group I patients. Conclusions: FNB is comparatively better in comparison to I.V. fentanyl when used as preemptive and postoperative analgesic in patients being operated for fracture femur. The most dreaded fear associated with any fracture is pain which has got wide psychological, clinical, and behavioral ramifications. Numerous researches and innovations have been carried out to give relief from this most unpleasant experience during intra-operative and postoperative period., Fracture femur is excruciatingly painful because the periosteal tissue is richly supplied by nerve fibers from femoral nerve and has lowest pain threshold among the deep somatic structures. Thus, adequate pain management before surgical preparation for any positioning, transforming, and immobilization of patients is crucial for management. Systemic analgesics, such as narcotics, are commonly used, but their side effects profile including respiratory depression, cognitive impairment, vomiting, urinary retention, and others limits their clinical utility during injuries of the head, chest, or abdomen.,, Any movement of the fractured limb in such patients leads to aggravation of pain. As such, various methods have been tried to deal with these clinical and sociobehavioral challenges so as to provide quality anesthesia services in the day to day practice based on both evidence-based medicine and logical empiricism.,, Previous studies suggest that the use of local anesthesia using femoral nerve block (FNB) is a safe and effective method. These methods can be carried out during prehospital care, emergency department (ED) and in the preoperative setting. Ropivacaine has emerged as a safer anesthetic for local and regional anesthesia (RA) and has replaced previously used anesthetic drugs. FNB is done blindly using a nerve stimulator with a needle. Besides, the emergency physicians with good anatomic knowledge could be trained for this technique easily. Hence, RA can be preferred over general anesthesia (GA) for these surgeries. FNB increases comfort and also been shown to improve positioning for a spinal block in such patients., There are limited data to establish the benefit of one form of anesthetic over the other. The objective of this prospective study was to compare the analgesic effects of FNB with intravenous (I.V.) fentanyl prior to positioning for a spinal block in patients with fracture femur and to compare the analgesic requirements in both groups postoperatively. After obtaining approval from Institutional Ethical Committee and written informed consent from all the patients, 60 American Society of Anesthesiologists physical status I–II patients of 18–70 years scheduled for fracture femur surgery under combined spinal-epidural anesthesia were included in this prospective, randomized, controlled trial. Patients with multiple fractures, peripheral neuropathy, bleeding disorders, psychiatric disorders, allergy to local anesthetics, spinal deformities such as kyphosis and scoliosis were excluded from the study. Randomization was performed using computer-generated random number table. The patients were randomly allocated in two groups of 30 each. The sample size was calculated on the basis of the mean difference of 2.4 in pain scores during the postoperative period. The number needed in each group was calculated by considering the power of the study to be >80% and an alpha error of 0.5. A sample size of 28 was estimated, but we took 30 patients in each group considering possible dropout and for better validation of results. Pain scores were assessed using a numerical verbal scale (0 - no pain, 10 - most severe pain). In Group I, FNB was given whereas in Group II patients, I.V. fentanyl 0.5 µg/kg was given 15 min before administration of RA. At admission, all patients were monitored with electrocardiography, pulse oximeter (SpO2), and noninvasive blood pressure measurement. The preoperative loading was carried out by infusion of lactated Ringer's solution (10 ml/kg) and oxygen was given via face mask to all patients. Patients in the FNB group received block guided by a peripheral nerve stimulator. The procedure was carried out by placing the patient supine, after identifying the anterior superior iliac spine and the pubic symphysis, a line drawn between these two landmarks. This line represented the inguinal ligament. Then, palpation of the femoral pulse was done and marked at the inguinal crease. The point of needle entry was directly lateral (1–1.5 cm) to the artery in the inguinal crease. At this landmark, the femoral nerve is maximally wide and superficial. The needle was directed cephalad toward the center of the inguinal ligament line [Figure 1]. The nerve stimulator was initially set at 1.0–1.2 mA. Then, needle was directed cephalad at approximately a 30°–45° angle. A brisk “patellar snap” with the current of 0.5 mA or less was indicative of successful localization of the needle near the femoral nerve. The nerve being superficial lies within 3 cm from the skin and lateral to the femoral artery. In our study, we injected 15 ml of 0.2% ropivacaine. After performing FNB and giving I.V. fentanyl in respective groups, quantitative relief of pain using visual analog scale (VAS) and satisfaction scores were assessed at interval of 2 min, 5 min, 10 min, and 15 min. Then, patients were shifted to the operating room and combined spinal epidural performed in sitting position after 15 min of giving preemptive analgesia while checking VAS during positioning. After confirming the appropriate interspace, 2% lignocaine (3 ml) was injected. This was followed by insertion of 18-gauge Tuohy's needle in the epidural space after confirmation by using the loss of resistance to air technique. By keeping a closed vigil monitoring of heart rate, a test dose of 3 ml lignocaine with adrenaline was given through the epidural catheter. One level below the insertion of the epidural catheter, the subarachnoid block was performed using 25-gauge Quincke's needle and 3 ml of 0.75% ropivacaine was injected after obtaining a clear flow of cerebrospinal fluid. Time to perform spinal anesthesia was recorded. Intra-operatively the time of onset, maximum level and duration of sensory block were recorded. Motor block was assessed using Bromage scale Number of epidural top-ups (given after two segments sensory regression) required were noted intraoperatively VAS was assessed postoperatively for 24 h and 8 ml of 0.2% ropivacaine was given in epidural catheter if VAS ≥4. Data were presented as median (range) or mean symbol ± standard deviation frequencies, as appropriate. The results were compiled and statistically analyzed using Chi-square test for nonparametric data and ANOVA for parametric data. Post-hoc students paired t-test was applied whenever indicated using SSPS III Statistics for Windows, Version 17.0. (Chicago: SPSS Inc). P ≤ 0.05 was considered significant and P ≤ 0.001 as highly significant. Demographic data were comparable in both the groups [Table 1]. VAS values were checked regularly after 2 min, 5 min, 10 min, 15 min, and during positioning of the patient. 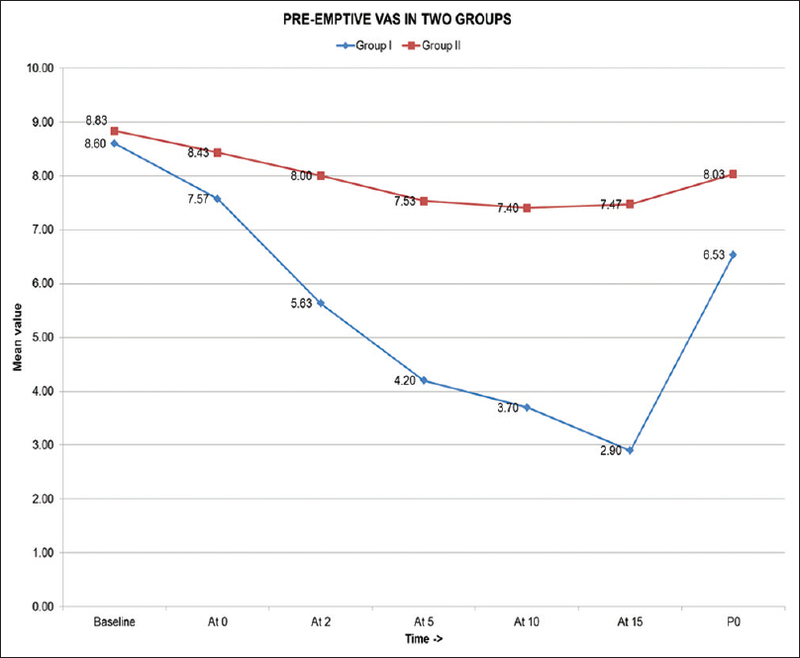 Group I (FNB group) had lower VAS scores compared to Group II (I.V. fentanyl) and the difference was statistically significant (P < 0.001) as shown in [Figure 2]. 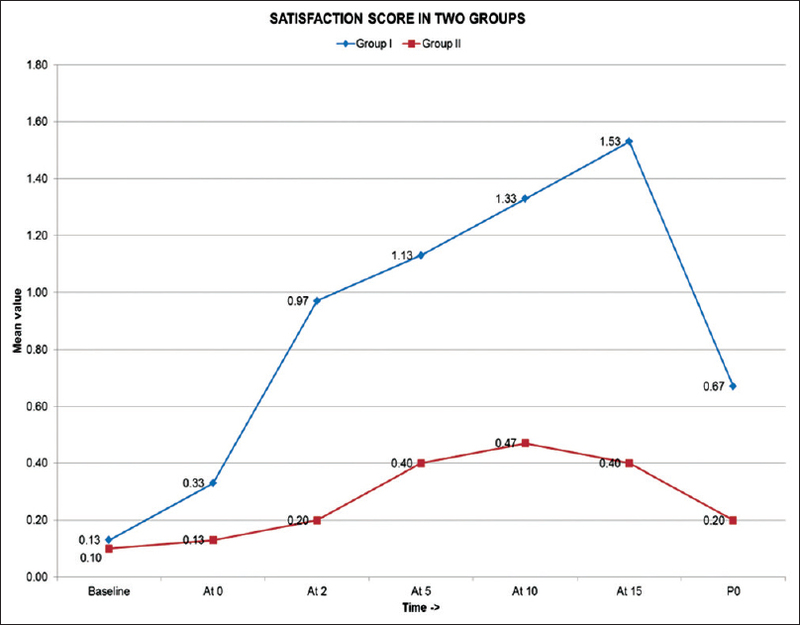 Satisfaction score was better in Group I when compared with Group II at all times (0.67 ± 0.547 vs. 0.20 ± 0.407) [Figure 3]. 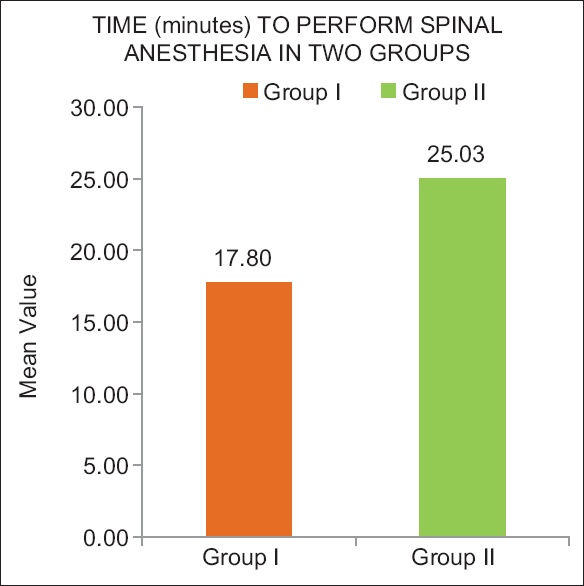 Time to perform spinal anesthesia was shorter in Group I versus Group II (P < 0.001) (17.80 ± 1.064 min vs. 25.03 ± 1.771 min) [Figure 4]. For I.V. 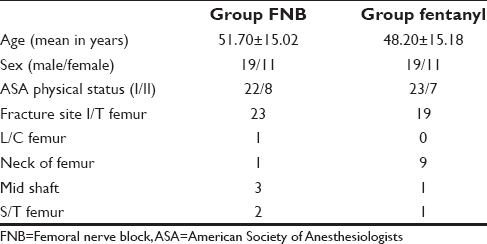 fentanyl group, the duration of postoperative analgesia was significantly shorter as compared to FNB group. The requirement for first epidural top up in I.V. fentanyl group was at 4 h and in FNB group, it was at 6 h. Three patients in FNB groups and four patients in I.V. fentanyl group required intra-operative epidural top up and this difference was not statistically significant (P > 0.005). 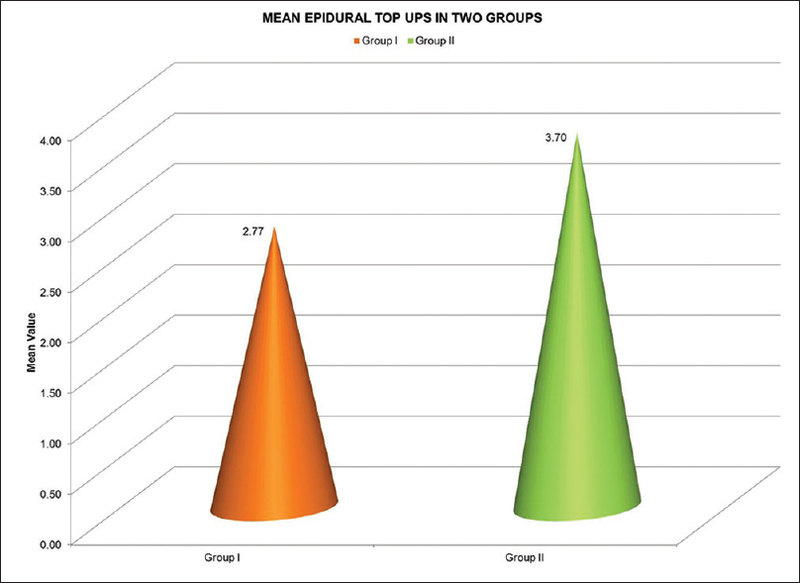 In Group I, number of epidural top-ups required were less as compared to Group II (mean epidural doses 2.77 vs. 3.70) [Figure 5] (P < 0.001). There was no significant difference in intra-operative as well as postoperative complications such as hypotension, bradycardia, nausea and vomiting, respiratory depression, convulsions, and anaphylaxis. No major complications were recorded with the administration of 0.2% ropivacaine, i.e. no signs of toxicity, convulsions, or cardiovascular collapse. None of the patients in both the groups had SpO2 <90% during the procedure. The results of this prospective, randomized study demonstrate that I.V. fentanyl 0.5 µg/kg given 15 min before RA and FNB using 15 ml of 0.2% ropivacaine provided similar pain relief prior to positioning of patients with fractured femur for the spinal block. An anesthetic technique that allows complete paralysis of all the muscles acting on the femur is mandatory to facilitate the intra-operative realignment of a femoral shaft fracture as a fractured femoral shaft is subjected to major muscle forces. In addition, Urwin et al. reported that there are advantages for RA compared with GA in terms of 1-month mortality and deep vein thrombosis. A Cochrane review  also stated that RA was associated with a decreased mortality at 1-month, even though this decrease was of borderline statistical significance. Furthermore, time to ambulation may be quicker in patients receiving RA. When considering the technique used to aid positioning patients for spinal block Schiferer et al. demonstrated that FNB provided analgesia after femoral trauma which was adequate for patient transport. Other studies have described the successful use of FNB for analgesia in the ED. The major problem for RA (spinal block) is the pain during positioning for a block in these patients. These problems are further heightened if we encounter obese patients for such surgical procedures. Sandby-Thomas et al. reported that the most frequently used agents to allow for positioning of trauma patients for RA have been midazolam, ketamine, and propofol. Alternative agents such as fentanyl, remifentanil, morphine, nitrous oxide, and sevoflurane have also been used, whereas nerve blocks are used infrequently. FNB was performed with 0.2% ropivacaine and time to onset was 6–8 min. The dose of fentanyl chosen was 0.5 µg/kg so as to minimize side effects as has been demonstrated in the previous studies where fentanyl was used as an adjuvant in RA., Both provided good analgesia, but it was better with FNB. It can be reasoned out by the fact that FNB produced relaxation of the quadriceps muscle and hence provided better analgesia for positioning and a shorter time to perform spinal anesthesia. Schiferer et al. demonstrated that FNB provided better analgesia after femoral trauma. Modified FNB was more effective than I.V. fentanyl when used for facilitating lateral position to perform sub-arachnoid block in elderly patients undergoing surgery for the neck of femur fractures., This technique was further modified by using continuous nerve block. These techniques decrease the time taken for the performance of spinal anesthesia. I.V. fentanyl had a shorter duration of analgesia and required more top ups compared to FNB postoperatively. This can be explained because fentanyl acts at the central level and has a shorter duration of action of 2–4 h, whereas FNB with ropivacaine provides longer analgesic effect upto 16 h (8–24 h). The comparison of the adverse events in both the groups intra- or post-operatively showed a nonsignificant difference. However, one patient in Group I had an episode of bradycardia which was successfully managed by I.V. atropine 0.6 mg.
FNB using 15 ml of 0.2% ropivacaine is a safe and effective method to alleviate pain as preemptive analgesia than I.V. fentanyl. FNB reduces the time to perform spinal anesthesia, increases the postoperative duration of analgesia and reduces analgesic requirements postoperatively. Bajwa SJ, Takrouri MS. Innovations, improvisations, challenges and constraints: The untold story of anesthesia in developing nations. Anesth Essays Res 2014;8:1-2. Bajwa SJ, Kalra S, Takrouri MS. Quaternary prevention in anesthesiology: Enhancing the socio-clinical standards. Anesth Essays Res 2014;8:125-6. Duc TA. Postoperative pain control. In: Conroy JM, Dorman BH, editors. Anesthesia for Orthopedic Surgery. New York: Raven Press; 1994. p. 355-65. Forouzan A, Masoumi K, Yadegar N, Rahim F, Feli M, Darian AA. Comparison of femoral nerve block with intravenous morphine sulfate for pain relief of femoral fracture. Asian J Sci Res 2015;8:429-35. Bajwa SS, Kulshrestha A. Craniofacial and maxillary anomalies: Anesthetic implications and management. J Sci Soc 2014;41:73-8. Chau DL, Walker V, Pai L, Cho LM. Opiates and elderly: Use and side effects. Clin Interv Aging 2008;3:273-8. Mutty CE, Jensen EJ, Manka MA Jr., Anders MJ, Bone LB. Femoral nerve block for diaphyseal and distal femoral fractures in the emergency department. Surgical technique. J Bone Joint Surg Am 2008;90:218-26. Parker MJ, Handoll HH, Griffiths R. Anaesthesia for hip fracture surgery in adults. Cochrane Database Syst Rev 2004;(4):CD000521. Bajwa SJ, Kalra S. Qualitative research in anesthesiology: An essential practice and need of the hour. Saudi J Anaesth 2013;7:477-8. Singh Bajwa SJ. Anesthesiology research and practice in developing nations: Economic and evidence-based patient-centered approach. J Anaesthesiol Clin Pharmacol 2013;29:295-6. Bajwa SJ, Kalra S. Logical empiricism in anesthesia: A step forward in modern day clinical practice. J Anaesthesiol Clin Pharmacol 2013;29:160-1. Pennington N, Gadd RJ, Green N, Loughenbury PR. A national survey of acute hospitals in England on their current practice in the use of femoral nerve blocks when splinting femoral fractures. Injury 2012;43:843-5. Khan B, Bajwa SJ, Vohra R, Singh S, Kaur R, Vartika, et al. Comparative evaluation of ropivacaine and lignocaine with ropivacaine, lignocaine and clonidine combination during peribulbar anaesthesia for phacoemulsification cataract surgery. Indian J Anaesth 2012;56:21-6. Fanara B, Christophe JL, Boillot A, Tatu L, Jochum D, Henri Y, et al. 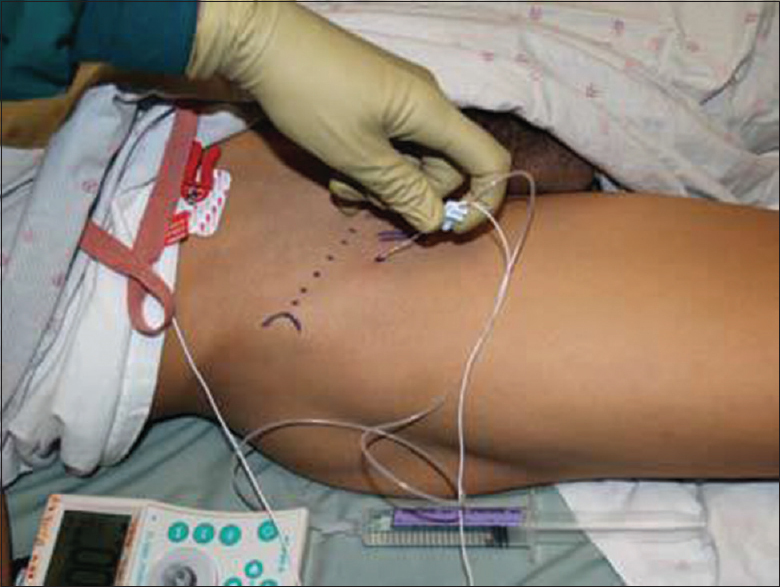 Ultrasound guidance of needle tip position for femoral nerve blockade: An observational study. Eur J Anaesthesiol 2014;31:23-9. Wu CL, Cohen SR, Richman JM, Rowlingson AJ, Courpas GE, Cheung K, et al. Efficacy of postoperative patient-controlled and continuous infusion epidural analgesia versus intravenous patient-controlled analgesia with opioids: A meta-analysis. Anesthesiology 2005;103:1079-88. Ong CK, Lirk P, Seymour RA, Jenkins BJ. The efficacy of preemptive analgesia for acute postoperative pain management: A meta-analysis. Anesth Analg 2005;100:757-73. Haddad FS, Williams RL. Femoral nerve block in extracapsular femoral neck fractures. J Bone Joint Surg Br 1995;77:922-3. Starr AJ, Bucholz RW. Fractures of the shaft of the femur. In: Bucholz RW, Heckman JD, editors. Rockwood and Green's Fractures in Adults. 5th ed. Philadelphia, PA: Lippincott Williams and Wilkins; 2001. p. 1683-730. Urwin SC, Parker MJ, Griffiths R. General versus regional anaesthesia for hip fracture surgery: A meta-analysis of randomized trials. Br J Anaesth 2000;84:450-5. Stanley I. The anaesthetic management of upper femoral fracture. Curr Anaesth Crit Care 2005;16:23-33. Schiferer A, Gore C, Gorove L, Lang T, Steinlechner B, Zimpfer M, et al. A randomized controlled trial of femoral nerve blockade administered preclinically for pain relief in femoral trauma. Anesth Analg 2007;105:1852-4. Fletcher AK, Rigby AS, Heyes FL. Three-in-one femoral nerve block as analgesia for fractured neck of femur in the emergency department: A randomized, controlled trial. Ann Emerg Med 2003;41:227-33. Sandby-Thomas M, Sullivan G, Hall JE. A national survey into the peri-operative anaesthetic management of patients presenting for surgical correction of a fractured neck of femur. Anaesthesia 2008;63:250-8. Bajwa SJ, Arora V, Kaur J, Singh A, Parmar SS. Comparative evaluation of dexmedetomidine and fentanyl for epidural analgesia in lower limb orthopedic surgeries. Saudi J Anaesth 2011;5:365-70. Bajwa SJ, Bajwa SK, Kaur J, Singh A, Bakshi G, Singh K, et al. Admixture of clonidine and fentanyl to ropivacaine in epidural anesthesia for lower abdominal surgery. Anesth Essays Res 2010;4:9-14. Lopez S, Gros T, Bernard N, Plasse C, Capdevila X. Fascia iliaca compartment block for femoral bone fractures in prehospital care. Reg Anesth Pain Med 2003;28:203-7. Yun MJ, Kim YH, Han MK, Kim JH, Hwang JW, Do SH. Analgesia before a spinal block for femoral neck fracture: Fascia iliaca compartment block. Acta Anaesthesiol Scand 2009;53:1282-7. Mosaffa F, Esmaelijah A, Khoshnevis H. Analgesia before performing a spinal block in the lateral decubitus position with femoral neck fracture: A comparison between fascia iliaca block and IV fentanyl. Reg Anesth Pain Med 2005;30:61. Capdevila X, Biboulet P, Bouregba M, Rubenovitch J, Jaber S. Bilateral continuous 3-in-1 nerve blockade for postoperative pain relief after bilateral femoral shaft surgery. J Clin Anesth 1998;10:606-9. Iamaroon A, Raksakietisak M, Halilamien P, Hongsawad J, Boonsararuxsapong K. Femoral nerve block versus fentanyl: Analgesia for positioning patients with fractured femur. Local Reg Anesth 2010;3:21-6. Wang H, Li EY, Xu GW, Wang CS, Gong YL, Li P. Intravenous fentanyl is exhaled and the concentration fluctuates with time. J Int Med Res 2009;37:1158-66. Casati A, Borghi B, Fanelli G, Cerchierini E, Santorsola R, Sassoli V, et al. A double-blinded, randomized comparison of either 0.5% levobupivacaine or 0.5% ropivacaine for sciatic nerve block. Anesth Analg 2002;94:987-90.